To be or not to be similar to a charismatic predecessor: that is the question. Research on CEOs’ and leaders’ charismatic behavior has emphasized the positive effect on employees’ attitudes and, in turn, organizational performance. 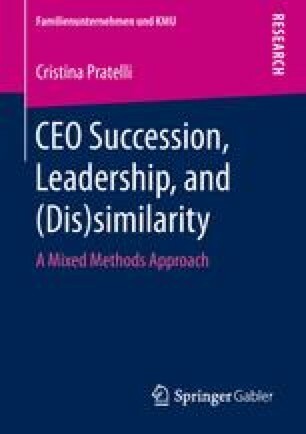 However, research on CEO and leader succession has stressed the negative consequences of this event. By combining the findings of both research streams and drawing on social and cognitive psychology literature, this study investigates the effects of CEO charismatic leadership style (dis)similarity on employees’ attitudes (organizational affective commitment and organization-based self-esteem). Data were collected from 124 employees in Switzerland at different time periods. The findings show that leadership style similarity between a new CEO (successor) and previous CEO (predecessor) positively affects organizational affective commitment and less significantly affects organization-based self-esteem. However, leadership style dissimilarity has a positive curvilinear effect on organizational affective commitment and a positive linear effect on organization-based self-esteem. Lastly, implications for theory and practice as well as suggestions for future research are presented.